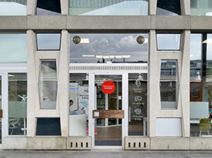 This business lounge is situated just moments from Stationstraat’s boutique retailers and cafes, while hourly trains connect you to Brussels and Leuven. Access to professional meeting rooms is available as is unlimited high-speed internet. Welcoming lounge areas, ideal for informal networking. A quiet place to focus on of Belgium’s key commuter hubs. Unlimited high-speed internet to keep you connected and professional meeting rooms so you can bring people together. Located right by St Niklaas' train station this business centre is in a very central and convenient location. There are hourly trains to Brussels and Leuven, with easy access to the motorway. The centre also offers convenient parking for you and your guests. Workspaces are beautifully furnished and full of character. Meeting rooms are easily booked out with the use of an app and can be used flexibly for networking, training and conferences. The centre also offers welcoming lounges where you can relax and network informally. All workspaces benefit from excellent facilities including high speed wifi, administrative support and excellent neighbourhood amenities.